Square Enix has released a trailer to coincide with the cross-platform port release of Final Fantasy XV Pocket Edition HD, which is now available for download on the PlayStation Network and Microsoft stores. A port for the Nintendo Switch has also been announced, but will be released at a later time. With a base price of $29.99 USD, it seems that the Xbox and PS4 ports are not following the same episodic formula that the Windows and mobile versions had, and the entire game will be made available upon purchase. 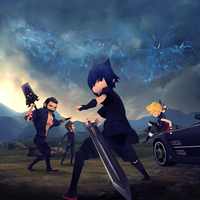 Final Fantasy XV Pocket Edition was originally released as a mobile version of Final Fantasy XV, and has since been steadily released across multiple platforms. You can check out coverage of the PC port for a video focusing on the first hour of gameplay. You can also check out the multi-platform launch trailer below. Final Fantasy XV Pocket Edition is available now on PlayStation 4, Xbox One, PC, iOS and Android devices. An Nintendo Switch port will be available at a later date.